A Little Sunshine For June's Room — walk in love. My original plan was to put this piece behind our couch. There is a gallery wall there that we've had for years, and I am so ready to refresh it and take it down. I picked out the Mountain Sunshine print because not only was it my favorite by far, I just fell in love with the yellow colors and pattern. It was so bright and cheery, and when I walk through my front door, bam!, that's precisely the kind of thing what I want to see. As soon as it arrived in the mail, I opened it immediately because I was so excited to see how it turned out with the copper frame I'd chosen! But, right after I pulled the frame out of the box, June (3.5-years-old) came into the room and entirely on her own, unprovoked, placed her hands over her heart, turned to me and said "Mama. This is beautiful. I love it so much." And I thought to myself "Welp, change of plans. It's going to go in her room." Because shouldn't we all react to art that moves us like that!? It was so genuine and heartfelt. I took down a few frames that were in her room that I hadn't updated in at least two years, filled the nail holes and hung up her new piece of art later that afternoon while we let June nap in our bed as a special treat. She was thrilled to nap in our room because we never let her do that. Plus, it gave me a few hours to make over part of her room as a surprise. I needed to make this little section of June's room more functional. 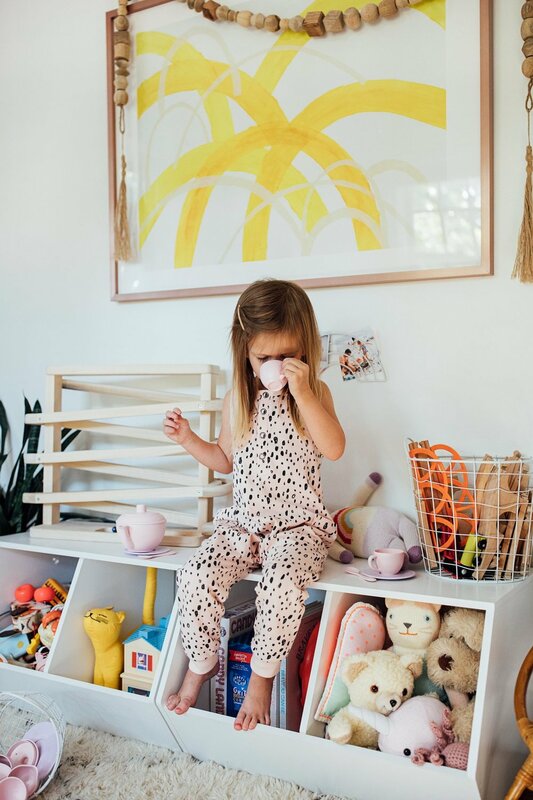 She's 3.5 now and loves to play with her trains, tea party set, dolls, and horses; therefore I've noticed that she needs more surface space to play on instead of just her floor. I picked up these toy storage bins and put two of them side by side, which created the perfect bench and table area for her to play on. Plus, they hold a ton of her toys and books, eliminating the need for the other giant bookshelf that was in her room. After her nap, when she came into the room and saw it for the first time, she was so happy. She just kept pointing to all the new things and dancing around with Zoe, her unicorn. I love the little re-fresh to her space and catching a glimpse of it out of the corner of my eye when I walk down our upstairs hallway. Now I want to freshen up more areas in our house. I've caught the project bug! We are entering my favorite time of year for sunlight in our home (#dorkyphotographercomment), but seriously you guys, nothing compares to September and early October sunlight in our house. The sun sets on the front of our house, so it comes through the trees, and through June's window, and it dances across her room, and it's magical. Just yesterday she was twirling around her room yelling "Maaaam! Look! I'm dancing with the sunlight!" 😍When I see the light start to look like this, I feel the change of seasons coming, and my insides get butterflies over all that's ahead of us. Does anyone else feel like September, or the start of the new school year, is a "new start" to your year? Even though we don't go back to school anymore, praise the Lord, I still feel it. The excitement over new things and a slight chill in the air. The next time you need to update a space in your home, or purchase art for yourself or as a gift, definitely check out Minted art. They curate some of the best of the best, and I guarantee you'll find something that's perfect for your home because I'm confident we will treasure this piece of art for years to come.